Diary of a madm…..er manager…. Managers Blog: Diary of a Madm…..Manager……. Sometimes it feels too much responsibility. I am not well. Then very few people at S2C are. But it can be easy to forget and I do too much and usually the end result is pain and a battle to stop myself receding into some dark place with a false sense of security. It is all to easy to take on too much and eventually something gives. I reached one of those points recently where I have had to knock a major project on the head as, in my judgement, S2C did not have the resources to do it. It will have undoubtedly disappointed a few people and it may lessen their opinion of us but better that than a project not done well and making us like fools. Then there is the day to day nitty gritty. Bills. We finally managed to get the billing for our unit sorted out and had invoices that we had been demanding since we moved in. We had budgeted accordingly and had the reserves to pay but it was a massive total that was the fault of somebody over who we had no control running a business in a rather haphazard way. It causes a lot of stress and means that S2C needs to tighten its belt for a few weeks. Then we move into the surreal. You leave the charity one afternoon and lock the door with all well and intact. You arrive early the next morning to find somebody has built a bike shelter across the access outside your unit meaning the route round and out to the exit has been blocked for our service users and their carers being dropped off by car. Unless of course they do an extremely tricky reversing maneuver while others are also trying to access the space and of course somebody has parked in the spaces that are yours who shouldn’t be there. I don’t often get really angry but that morning I was explosive and the poor junior manager of the particular firm responsible must have wondered what was happening but needless to say those with the power were conspicuous by their absence. I await to see how that particular saga unfolds but as the employees of the firm in question use the route past our unit as a thoroughfare they may soon find it has become and artistic assault course! The week was saved by an individual for whom I have great respect arriving at the door of S2C and asking if they could come in and hide from the madness. “I always feel a sense of calm and relax when I come in here” they said. The group were busy today making sheep for a project where they will go into a herd. This is to support a dementia project. Others were collaging and drawing. Once the ink had dried, we used inks and drawing pens to add detail and create a set of drawings. The group were in Comic Fest mode getting ready for the windows trail. Drawing up characters for painting, outlining and these will then be mounted ready. Most worked on our textile tree project with one or two doing their own thing. The group were yarn bombing the branches, felting fruit, berries and birds as well as making textile leaves. 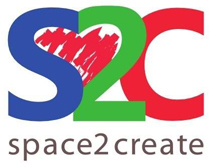 Space2Create is currently undergoing a few changes in its approach and the way it is run. On the face of it nobody using S2C will notice any difference but behind the scenes the changes will hopefully provide a better service and support to those using it. The trouble recently has been the growing complexity of what S2C does. When we were just a small group once a week at the back of a church room with 7 or 8 people it didn’t need a lot of management. From there we now have our own Unit used by an average of 100 people a week. It all brings challenges around ensuring everyone is safe, the place is funded, all the legal responsibilities are met and (most important) our service users needs are met. First thing we aim to do is to add to our trustees. We would be interested to hear from those who feel they might like this kind of role. We are looking for a few people to help us with specific skills and interests. For example somebody with connections to local business, somebody up to speed on legal aspects, somebody with fundraising experience or wider links to organisations nationally dealing with art and health. I think the key thing with any trustee of a charity is that they must fully understand what the charities aims are and how it works. Another are we are looking to improve is volunteers. As we have developed we have acquired volunteers who all do a fantastic job giving what time they can. Again as we grow and develop what we do then this starts to get confused. We have sat down and written some clearly defined volunteer roles that could be done by one person or a team. Space2Create has developed four strands really. Sessions run by us for the benefit of vulnerable adults at our unit, outreach sessions to other organisations and locations, the gallery and exhibitions involving our service users and local artists and finally providing space and resources for other groups to run their own sessions. As you can imagine the volunteers we have really need to focus on one or two areas in order to deliver the best service we can. Then we have all the projects we get involved with that involve collaboration with other organisations. The one coming soon is of course the Windows Trail for the Lakes International Comic Art Festival and our partnership with Costa Coffee in K Village this year. We have plans and are getting ready but if anyone out there with a talent in comic art would like to help out in the next couple of weeks to get the display ready we would love to hear from you. If you are interested in being a Trustee, a volunteer or have a go at the comic window display then get in touch. You can use the contact form on our website, email info@space2create.co.uk or call 01539 482540 (during open times or answer service). We would love to hear from you. The group were looking at using g figures images and looked at ways to get proportions right. We drew line figures first then fleshed them out and added colour. The 2Create group were designing characters for the Space2Create Comic Art Fest window display in Costa at K Village. Based on the menus at Costa we are planning a bit of a cartoon sitcom with theLatte’s and the Cappacino’s, two familys at homefor a comic fest EastEnders mash up! This week we took various leaves, painted the undersides with acrylics and pressed them onto paper, maps and newsprint, we also used the leaves as templates, drawing around them, cutting them out and using them to draw around. The group were making leaves for our indoor tree. We took some fallen branches and set them in a bucket of plaster. The group then started making fabric leaves using pattern books and felt along with other bits and sewing them HP. They wrapped wire to make stalks and put them on the tree. The DeafArt Group also joined in with designing characters for the Costa Comic Artfest Window today. Managers Blog: Mat reminds us of an important issue. On Saturday this weekend, it was Suicide Prevention Day. The stats over the last year have seen rises in suicides, particularly men and more alarmingly young people. I am not going to go into all the things you can do to help prevent suicide as that is well documented elsewhere but I do want to encourage everyone to take a look even though it can be a distressing subject. I think it is most important that everyone realises that they can spot the danger signs and be in a position, through even a simple word or act, to stop somebody taking their own life. One thing that has always concerned me being in charge of a charity dealing with Mental Health, among other things, is people’s fear of disclosure. It always disappoints me when, after an event or incident, you hear somebody say things like “Oooh I saw them last week and I thought then there might be something wrong….”; you get the drift. Hindsight. Any organisation dealing with the vulnerable has to have in place policies and procedures that easily and confidentially allow reporting of concerns. It is all too easy to brush aside a concern in day to day life but just a word to somebody can make a difference. Even worse is to not say something because it feels like telling tales. I can speak from personal experience. In reaching a state of mind where the only option you can see is to end your life, is such a dark and lonely space. The reasons and details may differ from person to person but it is self isolation and despair that lead to it. That one word or contact or action can make the difference. I was saved by one person taking action, immediately. The group were creating simple but effective pen and ink drawings with a little embellishment. First drawing an animal or character in pen in a very loose style. Then using brusho inks, again very loose, adding colour. Finally adding feathers for a touch of 3D ness! Today the group were at all sorts of different things. Some were just sketching, some making little felt owls, some butterfly collage pictures. Alongside this we were planning our Comic Art Fest windows display for Costa Coffee in K Village. The group were creating in an unusual way today by painting with coffee. Using ordinary granules mixed with warm water they used it like an ink. With the coffee darker areas could be achieved by going over areas a second time. Today the group were looking to start adding figures into their artwork. We started by looking at using very abstract forms. We mainly used oil pastels. The results were varied and effective. Mat gets specific with some definition clarification and a thank you for the Lakes Alive event. It was great to see the Comment piece in the Westmorland gazette where Cllr Chris Hogg was very kind in his words about the work Space2Create does and very enthusiastic about the benefits of art for those suffering Mental health problems and indeed many other conditions. I always geta little nervous around the words “Art Therapy”. There is art therapy and then there is Art Therapy. An Art Therapist is a highly skilled practitioner using creative activity to tackle serious mental health issues with a patient, using the art to target an issue and draw out responses from the individual to enable better support and recovery. For example an Art Therapist might use drawing activities with an individual who has suffered a trauma in order to understand what happened and get at events that the victim has been unable to talk about. It ranges from the very serious to more gentle issues. I must make it clear that at the moment this is not what we do at S2C! We use art as therapy for individuals suffering and recovering from mental or physical health issues. This is in the sense that we use art as a tool to help individuals rebuild their well-being, self-confidence, self-esteem, resilience and social skills. Ultimately we aim the help people move forward and start getting back into their communities as volunteers, into education or employment. We do not target art activities at a specific person or issue and the healing taking place occurs very much as a supportive and mutually beneficial group. What we do sits alongside the work being done by Mental Health Professionals in terms of psychological treatment, counselling and medication helping people cope with this and supporting them as they move through it. The Lakes Alive event at The Factory looks to have been a very successful day. At Space2Create in the one day we had well over three hundred people through. A big thank you to our volunteers who were on hand to help, talk and advise the people who visited and also a big thank you to all those who visited taking the time to look and appreciate the work going on. I am particularly grateful for those who bought artwork, made donations and offered volunteer help. We will be in touch. No pics this week as we had a bit of a break last week but all back to normal this coming week.